There's no better way to discover the mountain that the Nepalese refer to as, Sagarmatha, Goddess of the Sky, than in the company of other adventurous women from around the world. Join us on the journey of a lifetime through the Himalayas to the base camp of the world's highest mountain, Mount Everest! We’ll spend our days hiking around stupas, billowing prayer flags, and towering mountain peaks, and our evenings relaxing in local tea houses enjoying Nepalese hospitality and delicious Dal Bhat together. For this adventure, we’re proud to be partnering with Take on Nepal, a local organization with deep roots in the Himalayan region, that's dedicated to training and employing young women from Batase village as porters and guides. This opportunity, which is traditionally seen as exclusively for men, gives young women valuable paid work, skills, and life experience that will lead them towards a brighter future filled with more hope and independence. Sharing this experience and seeing the Himalayas through the eyes of these amazing young women makes this already incredible adventure that much more special. Together, let’s feel what it’s like to be on top of the world! TELL ME ABOUT IT ALL! On this adventure, more than any other, we and our fellow trekkers are at the mercy of the majestic Himalayas and Mother Nature. This means sometimes there are flight delays and cancellations that could move things around, and will require everyone to be more flexible when it comes to the itinerary and accommodation. Go into this with a good attitude and open mind - it’s all part of the epic adventure! You’ll be greeted with a warm Nepalese welcome at the Kathmandu Airport (KTM) by a local WHOA crew member who will bring you to our hotel in the heart of the city. In the evening, we’ll gather for a traditional Nepalese welcome dinner where we’ll meet one another and get briefed on the magnificent trek that lies before us! First thing in the morning, we’ll take a short and spectacular flight from Kathmandu to Lukla, the mountain town in the Khumbu region of Nepal, where our journey to Everest Base Camp will begin! Grab a window seat for amazing bird's eye views of the terraced landscape as it turns into the vast snow capped mountain range that is the Himalayas. Upon arrival, we’ll begin our trek straight away to the village of Phakding. Be prepared to be overwhelmed and humbled by the beauty and majesty of the region! Today the real trekking begins! We’ll walk past blooming rhododendrons (the national flower of Nepal) along a winding turquoise river that looks milky due to the melting ice flow. 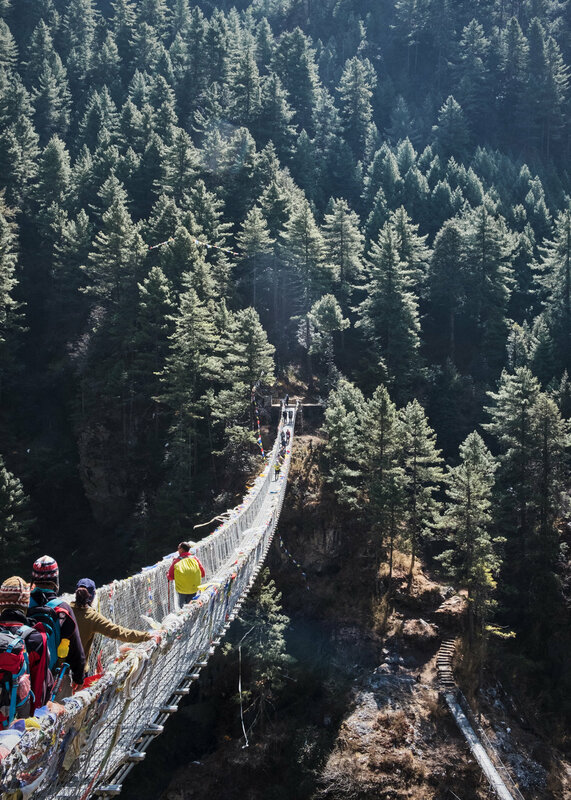 We’ll crisscross the water on iconic suspension bridges including the famous Hillary (aka Yak) Bridge. Our day's trek ends at Namche Bazaar - a historic, bustling trade hub perfectly situated in the arced slope of a mountain, giving glorious views of the peaks that surround it. Today is all about acclimatizing! After breakfast, we’ll take a short, relaxing hike to a wonderful view point where we’ll stop to enjoy some tea and clear views of Ama Dablam, or Mother's Necklace, and the mighty Mount Everest! You’ll have the rest of afternoon free to enjoy the beauty of the traditional mountain village of Namche and the hospitality of the local Sherpa people! Today, we’ll embark on a mountainside trail that will take us through pine forests, past stupas, and give us breathtaking views of some of the Himalaya's highest peaks. Just before we reach Deboche, we’ll stop in the beautiful and spiritual village of Tengboche that is home to a grand, important historic Buddhist monastery. Today we’ll help up our bodies further acclimatize to the altitude by hiking high and sleeping low - an important part of being a safe and smart trekker! We’ll walk up the mountain ridge that towers over Dingboche, taking breaks along the way at stupas with a view, before descending back into the valley for a relaxing afternoon. After breakfast, we’ll continue our ascent towards the world’s highest glacier, Khumbu, and the village of Lobuche. Along the way we’ll pay our respects at Khagan Chorten, a beautiful cemetery and spiritual Buddhist site that remembers those who have lost their lives on Everest. As we get higher, and the air gets thinner, it'll be more important than ever that we tap into our collective shakti, or divine female power and energy! We’ll start the day heading upwards with a challenging ascent to the village of Gorak Shep for lunch and breathtaking views of Mount Pumori. After lunch, we’ll walk along the famous Khumbu Glacier to Everest Base Camp (5380m), where climbers spend over a month acclimatizing and preparing for their summit attempt of the one and only Mount Everest! From Base Camp, we’ll enjoy a breathtaking view of the Khumbu Icefall, the seasonal tent village that is Base Camp, and, of course, have a dance party before descending to Gorak Shep for the evening. The high altitude and cold temperatures make this early morning one of the toughest parts of our trek, but, as you know by now, the greater the challenge the greater the reward! Today we’ll hike up to the highest point of our journey, Kala Pathar (5555m), for stunning, unobstructed, 360 views of the highest Himalayan peaks in the golden morning light. We’ll near the top just in time to watch the sun rise from behind the mighty Mount Everest, an exhilarating sight you won’t soon forget! Afterwards, we’ll head down a deep glaciated valley, past more shaggy coated yaks to Pheriche for the evening. Today we’ll start our relatively easy descent to Deboche and get the reverse views of trails we took from Lukla days ago. You’ll find that even on day 10 of our trek, you’ll never tire of the surroundings, and will still be awestruck and surprised by the beauty that is the Himalayas! The trail back to Namche is full of all the ups and downs and magnificant views you’ll have come to expect from the Himalayas. We’ll arrive after lunch, giving you the afternoon free to relax, do some shopping in the village, or grab a beer at the world’s highest Irish Pub! Today we’ll continue making our way down to Lukla for our final night (tear) in the Everest region. In the evening we’ll have our celebratory dinner to reflect and toast to the incredible experience and achievements we shared! On the morning of day 14, we’ll take our return flight from Lukla back to Kathmandu. We built in day 15 as safety travel day in case our flight to Lukla gets postponed or cancelled due to weather (which happens often)! Once we're back in Kathmandu, you'll be able to use the rest of your time to shop all the amazing handicrafts of Thamel, get a much deserved spa treatment, and have some momos before you depart for home or continue on your journey! NOTE: Flight delays between Lukla to Kathmandu due to weather conditions are quite common and a real possibility. To be on the safe side, we highly recommend booking your departure flight in the late evening of day 15. *Itinerary subject to change based on availability and unforeseen conditions, but that's part of the adventure! Even when things change, trust you'll be well taken care of with WHOA quality, professionalism, and TLC! **We highly recommend our adventurers to arrive at least one day early if possible! This will give you time to settle in, prepare your gear, and have a buffer in case of flight delays. After you book, you will get a link to our Pre-Adventure HUB that will give you all the details about how to make reservations for any additional nights. ***It’s of the utmost importance to us that any giving back we do is sustainable and fills a need that is of value to our partners. For that reason, our visits and partnerships can and do vary depending on the season, the organization's needs, and the abilities and desires of our group. Bottom line, in each case, we do due diligence to seek out local partners that are doing great, sustainable work, and we work closely with them to understand their needs to create an experience that will truly be of value to them and you!